Be the first to hear about their new releases and deals. Download the Booksprout app and search for Donald Firesmith today! 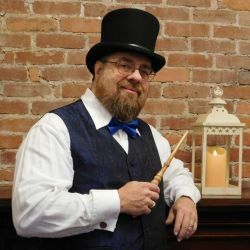 By night and on weekends, his alter ego writes modern paranormal fantasy, apocalyptic science fiction, action and adventure novels and relaxes by handcrafting magic wands from various magical woods and mystical gemstones. He lives in Crafton, Pennsylvania with his wife Becky, and his son Dane, and varying numbers of dogs and cats.